There are times when reading is absolutely necessary. There are times, here, when there is a great need just to read. It comes in cycles, I find: it tracks me for a while, behind me like a shadow; I don’t know it’s there. Then, quietly, it insists itself on the days of my life. In days like these I have every need to read widely. What can cause this? Do I not have enough words of my own to sift and assemble? It’s not this. I don’t know what it is. It’s a desire that can’t be pinned. It passes, though I also don’t know why this is; it passes, but when it’s here it’s like a thirst. Yet there is just so much matter out there in the ‘worlds’ we live in (paper worlds and digital virtual places). It can be overwhelming trying to locate the matter that needs the reading. I don’t know what I’m looking for, exactly, when I do look. I do know that when I find something that suggests it has a certain flavour to it, I must read it. I also know, however, that there is just so much wading to be done. Quadrillions of words in trillions of aggregations, perhaps, conspire to show repeated weaknesses. There is slurry, and maybe we’ve all contributed a little to this, alas. There are gems amongst this though. Perhaps the knowledge that these do exist, must exist, maintains the will for the hunt. ‘Writing is a safari . . . it means going out there and spotting, nabbing and bringing home to the cage of the page the most marvellous living stuff of the world.’ Who was it who wrote this (which I left unattributed in my Germany-period notebook)? It doesn’t matter here for now. If writing is a safari, so too is the preparation for reading. Taking an e-book by the hand is not so easy. It hides its secrets well and I sometimes find the e-book difficult. Let me see your pages whole, I think when I try to find it within the ink that isn’t ink at all, within the thin depths of the small plastic slab in my palm. I don’t care for the number limits of the chapters; I want to feel the weight of this whole book in time. Yet, even here, there are gems to be found: this I know; this I think. This phase of the present need to read isn’t over yet. I still haven’t found, this time, what I’m looking for — exactly; though I have found moments in some stories, stories in themselves that linger, possible books to re-read, possible authors to try from new. There is slurry, and there are gems, and there is commitment called for. Introducing my latest ebook release, ahead of schedule. I had planned to release this collection on or around February 28, but it all came together. Having learned the bulk of what I needed to learn for my first ebook release towards the end of last year, it was just a process of remembering the details. It gets easier, this publication process, especially if you follow the template you’ve devised the first time round. Now to the book itself. This has not been a quick write. This is fine. I like my words to settle, to take their time, to marinate. Four Kinds of Wreckage (FKoW) is a book of micro-fictions. I’ve been saying to anyone who’ll listen, and for quite some time now, that writing succinctly isn’t always as easy as it might appear. FKoW is comprised of thirty micro-fictions, ‘short shorts’, which range from a mere 60 words in length to just over 700 words. I would like to make it clear that this collection hasn’t just been trotted out in a couple of hours. On the contrary, it was written in parallel with my other recently published book, Disintegration and Other Stories (DaOS), and the two titles have taken — in total — three years to produce: in the writing, in various peer review processes, in editing, in the loving removal — where necessary — of aspects that needed this. Micro-fiction does not mean micro-thinking! There are some overlaps in themes in the two books. I aim to produce a ‘body of work’: this is the writing plan. As such, FKoW (Volume I) will inform Volumes II and III. They will be linked. FKoW and DaOS overlap in places. The individual pieces in FKoW each connect, not in characters or storyline or the like, necessarily, but they connect to the piece immediately before and after in the running order. In these ways, this body of work, this density of the written assemblage is gathering around me. I had aimed to release FKoW for free. However, the cheapest I can release it for, as a permanent price, would appear to be £0.77 / $1.17 / €0,89, etc., at the time of writing (Amazon have an annoying habit of shifting the dollar price, slightly and occasionally, and not making that known). The sterling price of such offerings does seem to remain pretty constant though. This is a short book, so I offer it at the lowest price. However, I add a caveat to all readers: please read it slowly. My writing pays deliberate attention to the particular words I’ve used, to the rhythm of the piece, to stories within stories, to references to myths or folklore, in places: just because a piece is 200, 300 or 400 words long, only, it doesn’t mean it should be flicked through at pace. This is one of the points of micro-fiction, as I see it: that much can be transmitted in few words. Hemingway’s famous six worder is a case study (I won’t repeat it here, but you’ll find it if you need to); Kafka wrote a series of short ‘meditations’; Brautigan was keen on brevity; Calvino wrote some beautiful gems . 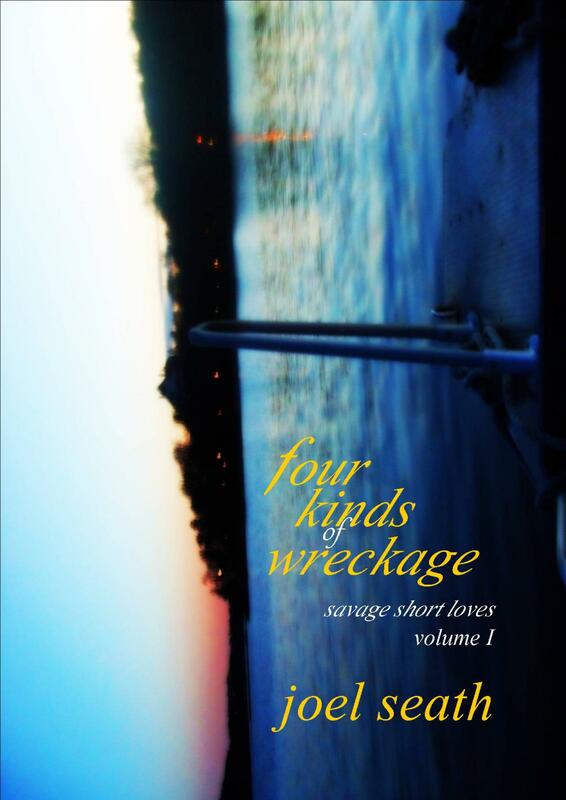 . .
You can find details of how to get a copy of Four Kinds of Wreckage (Savage Short Loves: Volume I), and other releases, at the Bookshop link above or click here. Scroll to the bottom of that page to find out about the free Kindle App for PCs (if you don’t own a Kindle device). I thank you, and if you buy any of my book offerings please do let me know your thoughts on them. Yesterday’s post, on reflection, didn’t have the clarity and brevity that it needed (despite a reblogging — thank you for that Yas). The words weren’t left to settle long enough. So, in the spirit of trying to aim better, I now aim to make amends in the edit. Brevity and succinctness are often misunderstood. A very short story may well receive the feedback that ‘it feels like it could be developed into something longer.’ This entirely misses the point. Holly Howitt-Dring’s essay uses the heading ‘micro-fiction’ as an umbrella term which includes ‘flash fiction’ as well as the ‘short short’. However, I would suggest that flash fiction is more inclined towards quick, timed writing rather than the studied brevity of ‘micro’, as I read it. ‘Micro-fiction’ in this article, therefore, is a form of writing that the author has given plenty of consideration to. There is historical precedent for micro-fiction. This reader considers some works as micro-fiction, even if the author didn’t originally label them as such. I offer up three examples of historical micro-fiction. These examples are chosen because (i) they appear to have been considered, despite being short, in the writing; (ii) they appear either as parts of a greater whole — a ‘novel’ — or as part of a collection of stories, or as linked pieces; (iii) they can be read as individual pieces in their own right. Brautigan’s The God of the Martians (1955/56) — six hundred words, divided into twenty ‘chapters’ — is an example that might seem to contradict my earlier statement: that developing a short piece into a longer one misses the point. I use Brautigan’s novel as an example of turning that thought around though: a ‘longer’ piece (albeit only six hundred words) can be viewed by way of its short separate entities — in this case, a series of averaged thirty-word, stand alone stories in themselves. Kafka’s Meditations (1906-1912) and A Country Doctor: Little Tales (1914-1917) are individual pieces/stories that have been collected into a greater whole. They each stand alone. Calvino’s Invisible Cities (1974, 1979) are linked, yet they’re stand alone pieces. Micro-fiction is misunderstood. It is something to aspire to (and there is a body of work to act as precedent). Writing with brevity and succinctness takes some great skill. It need not be the start of something longer (although it can, of course, be a part of something wider): micro-fiction is a beauty in its own right. Brevity and succinctness are often misunderstood. Put a piece, a very short story, up for peer review and — though it may receive favourable feedback — there’s often a comment tacked on: ‘It feels like it could be developed into something longer.’ This entirely misses the point. If it’s good in its brevity, there may be a lingering after the reading. The reader may not remember every word, or every detail, every placement of every subtlety, but they may be left with the possibility of the piece playing around in their mind. Sometimes, that playing is the embodiment of the tale itself; sometimes the piece read may turn itself towards the reader, asking ‘so, how do you feel?’; sometimes, a reader’s other memories may rise to the surface as a result. Writing micro-fiction is a challenge in itself. Let’s not confuse the terms ‘micro’ and ‘flash’ fiction here: the former, as I see it when I write it, is a craft, an art-form in the developing; the latter, though it may result in something good, is a quick race through of words, a sprint — something splashed down quickly. There’s much to condense [in a micro-fiction piece], much left unspoken to the point that the writer makes a pact with the reader: you will not be told everything, you will guess and then, in return, be allowed to interpret the stories as you wish. As notable examples of micro-fiction, even if they weren’t termed as such at the time of their writing, I think of work by Richard Brautigan, Franz Kafka, and Italo Calvino. In 1955/56, Brautigan wrote a subsequently unpublished ‘novel’ called The God of the Martians. He experimented with twenty ‘chapters’, the total word count of the work coming in at just six hundred words. It was rejected by the editor of the literary magazine he sent it to. Brautigan was, it would appear, ahead of his time. Kafka was also, perhaps, writing short pieces before they could be accepted. However, in this case it was the author himself who didn’t consider them worthy. In the editor’s notes to the 1992 version of Kafka’s Metamorphosis and Other Stories, Malcolm Pasley quotes the author, regarding his series of short meditation pieces (1906-1912): ‘The few unsold copies of Meditation need not be destroyed, I don’t want to give anyone the trouble of pulping them, but none of these pieces should be reprinted.’ The editor goes on to write that the book met with favourable review when it was published. Metamorphosis also includes a series of short fictions under the collected title of A Country Doctor: Little Tales. Calvino’s Invisible Cities (English translation 1974, 1979) is just an exceptional series of short fictions, all of which relate a fictionalised account of a different Venice. It may never have ever been termed as a series of micro-fictions anywhere else, but to my reading eye that is exactly what it is. Micro-fiction is misunderstood: it is something to aspire to (and there is a body of work to act as precedent). Writing with brevity and succinctness takes some great skill and, although the examples I offer up contribute to greater wholes, each piece is also something in itself. Each micro-fiction need not be the start of something longer because each micro-fiction is a beauty in its own right. Some years ago I bought a book, sponsored by the Daily Telegraph, entitled Mini Sagas (Sutton Publishing, 1997). I forget why I bought it: was I enticed by an article in the newspaper (a publication I don’t usually read), or did I find the book by chance in a shop? It doesn’t matter. Herein lines the first thing to know about writing the brief story, or the short short, or the micro: cut out the extraneous detail. I’ll start again. Some years ago I bought a book called Mini Sagas. The book promotes the fifty word story: the whole deal in just fifty words (beginning, middle, end; setting, characters, crisis, climax, resolution). Everything. Now, how on Earth do you do that? How do you imbue a story with that eerie lingering quality? Perhaps, like the poetry writer might advocate, if you reconcile yourself to the idea that you will write mounds and mounds of average pieces, somewhere in amongst it all will emerge a gem. Gems happen. I’ve often thought that there are, roughly speaking, two sorts of stories: the one where you think it all through and know the way the setting, crisis, climax and resolution will unfold; then there’s the gem that just happens. Creating gems (by the planned route or by providence) is what writing micro encapsulates. I’ve been searching all my life for those writerly gems, even before I first heard of the various terms for micro writing. The search is a continuous one. There is a peculiar deftness to writing succinctly. We look for it by chipping away. We strip away the mounds of the unnecessary, the frivolous, and the superficial. We are left with the beautiful details. Note: this article was first published at www.writersdock.com under a pen name.